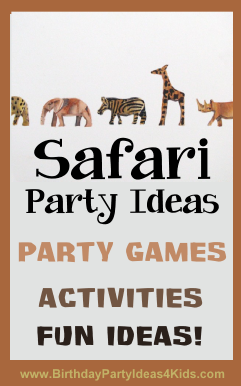 Fun Safari themed birthday party ideas, party games, birthday activities, decorations, invitation and fun ideas for Safari themed party food. Fun for kids of all ages 1, 2, 3, 4, 5, 6, 7, 8, 9, 10, 11, 12, 13, 14, 15, 16 years old! Mix and match the party ideas that will make the best party for your child and budget. On invitations that are plain on the outside place stickers of different safari animals. Or draw on footprints of several different safari animals such as zebra, giraffe or lion on the outside of the cards and on the inside say something like "Everyone's on their way to ______'s Safari party!" Attach a pair of plastic binoculars to the invitation and on the inside say "See you at _______'s Safari party!" Zebra or giraffe patterned cards. Tie black, brown and green helium filled balloons to the mailbox to let guests know where the party is located. Draw zebra, lion and giraffe foot prints on the sidewalk outside the party with sidewalk chalk. The party table can be decorated in any bright color (solid colors work best for this idea ... orange, yellow or blue are great colors) and for a safari twist place zebra or giraffe print placemats under the plates. Buy or make large giraffe and zebra cutouts and use them for a center piece. Place toy jeeps and sand along with the safari animals for the centerpiece. Place a safari or camouflage hat at each place setting along with a pair of binoculars. Have adults that are helping at the party dress up in khaki shorts and shirts and wear a name tag that says "Safari Guide" and their name. Rent a Safari or animal themed bounce house and let the kids take turns having fun bouncing around inside. Paint the party guests faces and turn them into zebras, elephants, giraffes and lions! Check our Face paint page for great homemade face paint recipes. Hide plastic animals, footprints cut from paper or candy around the party area for guests to find. Let them use binoculars to search for the items you've hidden. If the birthday party will take place at night give guests small flashlights to search for the animals. Let the children keep the animals and candy they find or turn them in for prizes. In a safari scavenger hunt teams race and either find objects on a list or perform the "to do" things on a list. We have a great Animal Shelter Scavenger Hunt list that would be fun for a Safari themed party. Collect items around the neighborhood for your local Animal Shelter and have fun too! 7 varieties of fun scavenger hunts you can use at the Safari party. Children sit in a circle on the floor. The birthday child (patter) starts by walking around the outside of the circle and patting the head of each child. Every time they pat a head they call out "elephant". Then they choose one person to be the giraffe and yell "GIRAFFE!" when they pat their head. The “patter” then runs clockwise around the circle and tries to sit down in the place of the giraffe before they are tagged. If the giraffe tags the patter then the giraffe sits back down and the patter starts again. If the giraffe doesn’t tag the patter then the giraffe becomes the patter and the game starts again.